Fetch the Charms bar by sliding your finger inward from the screen’s right edge. Then tap the Settings icon. Tap the words Internet Options, near the top of the Settings pane. The Internet Explorer Settings pane appears. Zoom: Handy when you can’t read the tiny text on websites, this sliding bar lets you choose the magnification level to view sites. If you’ve set up the desktop to enlarge the screen by 125 percent, this will be set at 125. That’s fine for most websites, as you can pinch or stretch them to the size that best displays their content. Encoding: Rarely used, this area lets you change how the browser displays sites containing foreign languages. 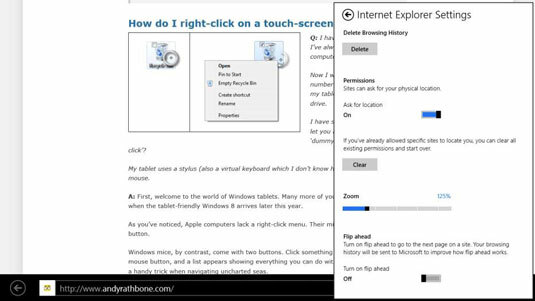 Tap anywhere on the web page to close the Internet Explorer Settings pane and return to browsing.